Please note that there will be an Invite Qualifier tournament during the preseason. This is where where we push the bottom two invite teams down and use a qualifier to field potential invite teams for season 2. More details on that will be announced around the end of season 1. Competitive integrity and fairness is an aspect that is integral to the state and healthiness of a league. We want to ensure that the players of the desired skill level are playing in their correct division with others around them that are similarly skilled. Going into the first season of RGL HL, we know we made mistakes regarding placement and have not always been perfect regarding our decisions. We are still carefully monitoring the divisions to ensure that teams are not intentionally sandbagging in the lower divisions and are aiming to better solve these issues. Here are the specific guidelines and restrictions about players that we used to evaluate each said team during the off-season and in the present. Please note that we weighed the past 5+ seasons of HL differently. (e.g. how S25 Platinum was better than S24 Platinum). This along with the move-up rules been updated in our rules section under Rosters . It should be mentioned that UGC changed their naming schemes this season and merged all the divisions from previous seasons, so players should only take into account current RGL placements or UGC rankings S25 or earlier when allowing ringers. These division guidelines and ringer restrictions will also be updated on the League Table. Players can only roster or ring on Teams one division below their current rating. Otherwise, they must be approved by admins or the opposing team leader. Players that currently exceed the division guidelines and restrictions will be permitted to stay on the roster for that division under a case-by-case basis. With the first season, we are going to be relatively lax with these guidelines. Unless there is a clear and obvious intent of a high level player joining a lower division to curb competition, then that player should be fine playing in said division. An example of the contrary would be a high-platinum player (RGL Invite) joining an RGL HL Main or Intermediate team. Like with the exploits stated further, please contact an admin on Discord if you need clarification or confirmation regarding a player’s eligibility in a division. This is just a reminder regarding two major bugs that can impact the outcome of the match. Like with any exploit, if you believe that a team is purposely taking advantage of these bugs, please contact us on Discord. The first major exploit is ubercharge building while paused. This often can be unavoidable as most medics have the Valve autoheal enabled, which will carry over to the pause. To combat this, we recommend teams issue a warning before a pause to ensure that the beams are not connected. The 2nd exploit is regarding stickies that are grouped up together that can detonate and damage player through walls. For both exploits, disputed rounds may be played and/or punishments will be given to teams and players accordingly. 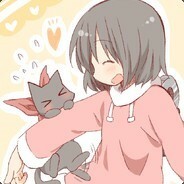 We are going to be raising the team size capacity from 15 to 18. This should be effective now, so please make sure you take advantage of this before the roster lock deadline. There has been some confusion regarding medals. It should be stated that everyone on your roster will get medals for Season 1. Medals are currently in the process of being approved in-game and the design will be shown once this happens. There will be "placement" medals for every division. Ringers have been an issue that have been brought up a lot within the past weeks. For the first ringer, as long as they are within the skill range of the person they are replacing, they cannot be denied. However, the second and third ringers must be approved by the enemy leader. Please contact an admin if a team is trying to bring a ringer that is greatly better than the person that they are replacing in the match. Please note that during the regular season, King of the Hill is played to a best of three for each half -- with the team winning once they achieve 4 match points. For playoffs, King of the HIll is played to a best of 5 for one half. Make sure you have our updated RGL HL config and that you are not using the wrong config. Another reminder that rosters will lock at different dates depending on your division. For invite, rosters will lock on November 6th. All divisions below will lock on October 16th. Before when you joined a roster, you were marked as a “New” player for 24 hours. This has now been decreased to 18 hours to allow teams to tryout new players on Sunday and have them eligible for the match on Monday. The Invite map pool for King of the Hill will now be using “koth_warmtic_b6” over “koth_warmtic_rc4”. This is to remain consistent with other leagues. Please make sure your servers are using the correct version of the map for scrimmages and the match. Thanks. There are three rule changes. First of which is clarifying that all RGL HL matches must be played on servers in the Continental United States. Servers in which the away team has an average team greater than 100ms must be moved as well. We are also clarifying the POV recording rule to make it clear here. 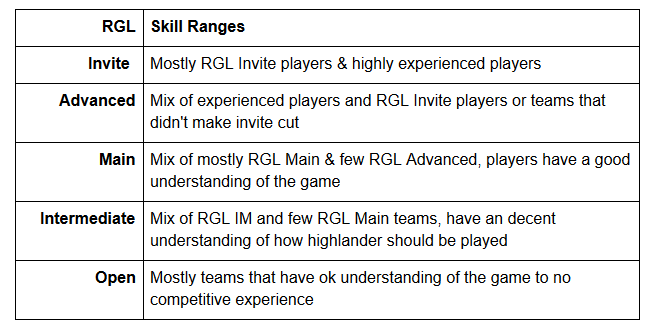 Finally, we are clarifying the use of the RGL Highlander servers here. Our producer Dolphin is working on an end-of-the-season video for both the highlander and prolander seasons. Please submit any impressive plays here. All divisions are encouraged to submit a play!